The Concordia Stingers men’s basketball team snatched two consecutive wins from the Bishop’s University Gaiters on Thursday, Jan. 18 at the Concordia gym and again on Saturday, Jan. 20 at the Mitchell Gym in Lennoxville. 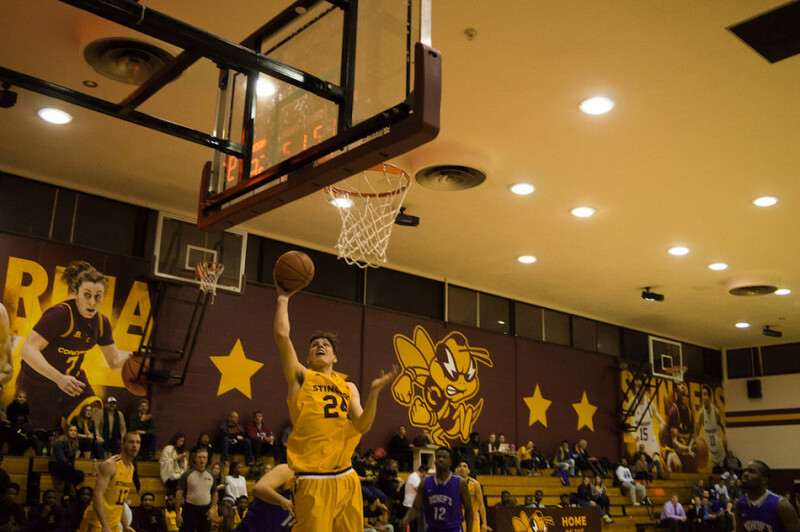 Thursday evening, the Stingers won by a five point lead. Guards Ricardo Monge and Ken Beaulieu scored a total of 43 points combined, and Jonathan Koud went on to add 16 points during Thursday’s game. “We had a couple of rough games lately so I was just trying to be more aggressive and get on another winning streak and that’s why I was taking more shots during this game,” said Monge. The second quarter of Thursday’s game saw the Stingers behind the Gaiters, who took a massive lead scoring 34 points in the second quarter with the help of Abdul Kamane, David Belanger, and Joany Castor Thadal. “I thought our bench didn’t produce well when they came in and that kind of gave the life on the other side, they were the more aggressive team in the second quarter and we were way too passive for my liking”, claimed Stingers head coach Rastko Popovic. Later, the Stingers were in a space where they had to make a very quick decision to bounce back and claim the lead once again as the Gaiters were shepherding by four points. The Stingers took advantage of the second half to claim their spot once again and getting 46 points in. The Gaiters also managed to keep the score quite tight throughout most of the forty-minute period. The Stigners may have come away with the win, but Popovic wasn’t fully satisfied with his team’s performance. He expressed his dissatisfaction when it came to consistency and discipline, as he thinks that the team can do much better. He acknowledges that regularity is key to every win and that the Stingers shouldn’t feel that they’ve reached that despite this win. He kept a very poise attitude when it came to the victory against the Bishops Gaiters. “I thought we competed, like I tell our guys in basketball or any sport, all I can ask [from them] is to compete for forty minutes. And you’re not always going to win, sometimes the best teams are going to lose to the worst teams and vice versa. It happens all the time in any sport”, said Popovic. The Stingers focused on getting consistent since the beginning of the season and they have noticed a major improvement. However, Popovic believes that it’s about being consistent every single game, even when they’re facing a loss. Popovic also stated that rebounding was an issue that the team was focusing on. “Turnovers were way too high for my liking against this team, we had 18 turnovers but we found a way to win the game”, says Popovic. The Concordia Stingers will be facing Laval Rouge et Or at the Concordia Gym this coming Thursday, Jan 25.